Mike and Kane aimed to find the areas where sales teams underinvest across seven key responsibilities: hiring, onboarding, pricing, process, structure, training & development and upsell. 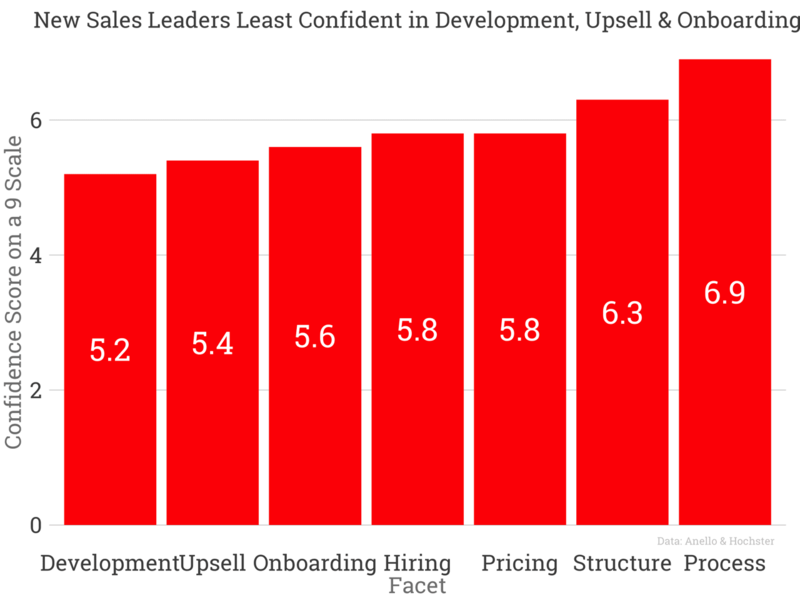 Rising sales leaders reported being the least confident in Development/Training, Upsell and Onboarding across these seven responsibilities. Seasoned sales executives, when asked where early stage companies over and under invest confirmed those areas. The chart above shows the seasoned executives’ opinions on a 9 scale where 4.5 is investing enough. Less than 4.5 means investing too little and above means investing too much. From their point of view, early stage companies spend too much effort optimizing the structure of their teams and not enough of the onboarding, development and hiring of their people. Sales trainers, people hired to train new account executives, are an important part of onboarding and development. About 22% of those surveyed employed full time trainers and most agreed a full time hire makes sense at between 33-40 account executives, which is the roughly the same time sales leaders believe ramp times become predictable. 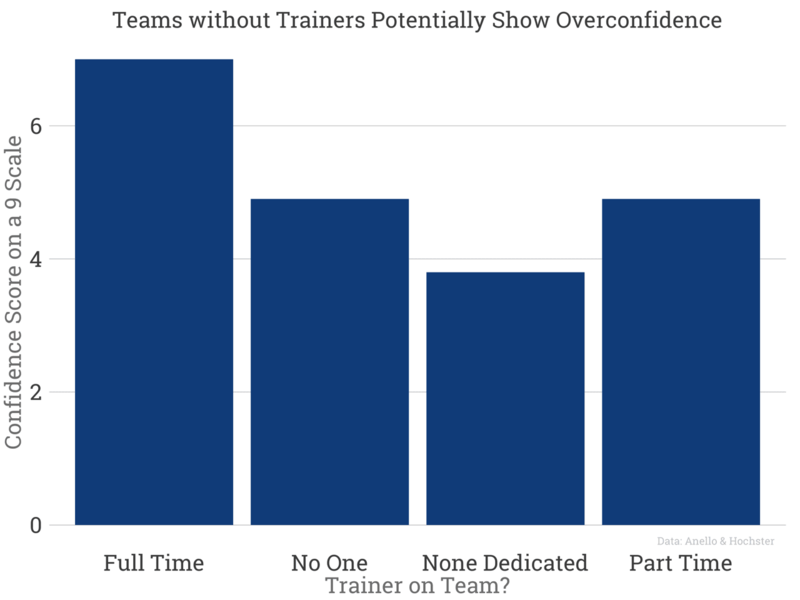 Those teams with sales trainers reported much higher confidence than those with part-time trainers or no trainers. That makes sense since there’s a person in the organization who is evaluated exclusively on training people well. Interestingly, those without trainers reported the second highest level of confidence, perhaps suggesting some bravado in self-evaluation. The hiring process a critical part of a growing sales team. Mishires often take 3-6 months to discover and are quite expensive. So how can scaling companies improve their hiring process? With data. There was a significant difference between those who measured key attributes of each new hire like coachability work ethic, prior success, and those that didn’t. Data-driven sales people averaged a hiring confidence score of 6.8 vs. 5.1. 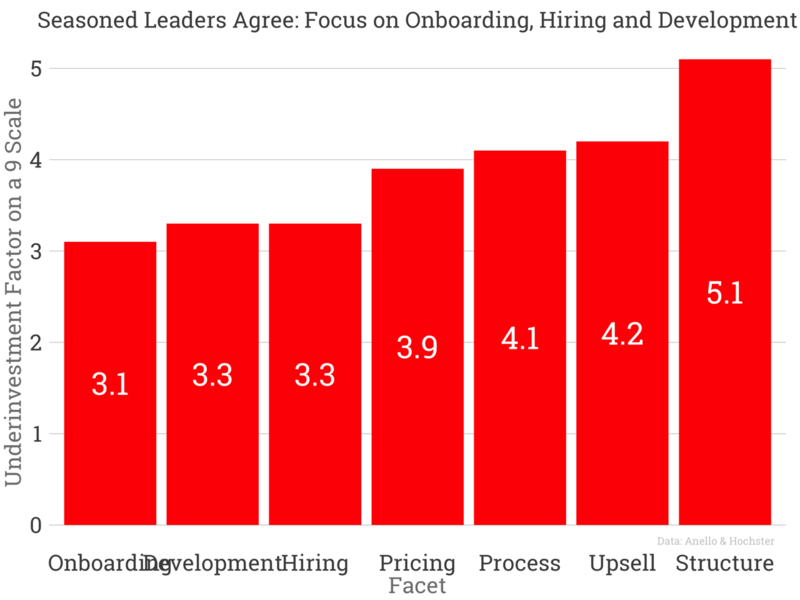 This survey suggests team development including hiring, onboarding, and training are areas where sales leaders have the least confidence and are likely good areas to explore and invest when scaling a SaaS sales team. In addition, systematic measurement of sales hires seems to reinforce a leader’s ability in the team. Thanks to Mike Anello, Kane Hochster and Mark Roberge for sharing the data and their analysis with me. Survey data skews to early stage companies: More than 22% of responders were at companies with at less than $5M in ARR and 47% less than $50M in ARR.